Downtown Birmingham is definitely having a moment. 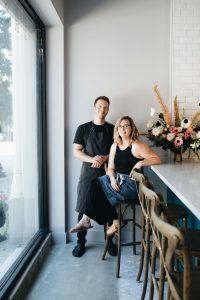 This summer has been full of exciting additions to the area and the H2 office is buzzing about our new across the street neighbors, The Essential, a new concept from the founders of Baking Bandits and Feast & Forest. We stopped by the recently opened restaurant – located at the bottom of Founders Station on Morris Avenue – and chatted with owner Kristen Hall about her vision, how she got here, and of course, food! “When we opened Feast & Forest the long term plan was always to expand and find a bigger space, but that need ended up coming much sooner than expected,” Kristen explained over coffee. Architecture was key to their vision, which led Kristen and co-owner Victor King to search for the right space for two years. When they initially looked at the location The Essential now occupies, it was a bank drive-thru that was partially underground. The building itself dates back all the way to it’s construction in 1887 so needless to say it took some creative vision to turn this spot into a charismatic restaurant. 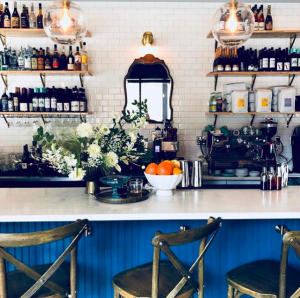 The cobblestone charm of Morris Avenue and untapped potential of the historic street were key factors in selling the space to the restaurateurs. “It has been a long time since this beautiful street has seen it’s full potential,” Kristen noted. In the end, they felt that choosing this new home on Morris Avenue would hopefully spark more businesses to join them. While it’s apparent that Kristen and Victor have found their professional sweet spots, their paths weren’t always headed in this direction. Kristen, who has a bachelor’s degree in biology and masters in public health, had spent her first twelve years working at UAB in medical education and community relations. But, she was always dreaming of new things, and eventually the time was right. 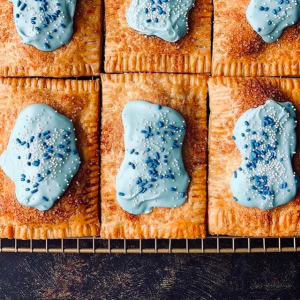 “Sometimes things chose you.” The mom of two, soon started baking with her daughters and would leave treats on neighbor’s doorsteps, ring the doorbell and leave. Hence they became known as the “Baking Bandits.” That venture spiraled into Saturdays at the Farmer’s Market and eventually led to Kristen entering and winning Birmingham’s first “Big Pitch “ competition. Photo Credit: Mountainside Photo Co. So why rebrand from Feast & Forest to The Essential? “Feast and Forest was a season, a chapter in a book, and it was very specific to that space,” Kristen detailed as she described why The Essential needed a story of it’s own. Victor and Kristen’s love for food and produce led them to want to do the minimal amount of things to it in order to make the food taste it’s best. They wanted the space, menu and name to honor this straightforward approach, thus “The Essential “ was born. Fans of Banking Bandits need not worry though, just like these famous pastries were a part of Feast & Forest, they’ve once again found their new home at The Essential and Kristen is excited to announce the imminent launch of her new blog which will be centered around the fundamentals of baking pastries. The Essential offers unique options for every meal. The menu will change seasonally so be sure to stop in every few weeks for a good sampling of what they offer. If you’re headed over there for the first time, Kristen recommends trying the Eggplant and Okra “It’s the perfect collaboration for summer.” She also recommends trying the Chicken Liver Mousse Éclair – the perfect collaboration of Kristen and Victor’s pastries and savory tendencies. “It’s the best of both worlds, I love to take pastries to unexpected places.” If that’s not your speed, they make all pastas by hand and Kristen suggests trying the rigatoni, paired with the roasted beet salad, and pork shoulder with peaches, cucumber and peanuts from next door! Try the blackberry almond cake and lemon meringue tart for dessert. 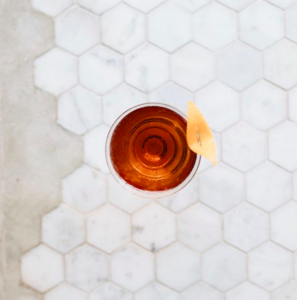 The aesthetic at The Essential is dripping with charm – a unique marble tile pattern lines the floor around the bar and a rich blue tone is carried subtly throughout the restaurant. “One thing we wanted to accomplish was to be open 7 days a week so that we can be part of every person’s, every day – from breakfast to cocktails. 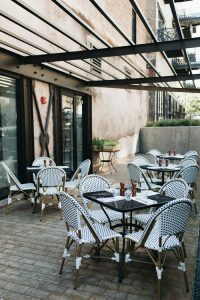 We wanted to create a home away from home for people who live and work downtown and love our city.” The end goal with the design was always to transform people’s experience of Birmingham and both owners are proud to know that their Parisian-esque spot transports people out of their typical Birmingham environment.